We often encounter muscle pain and weakness in such patients. Our team identifies these conditions that affect your peripheral nerves or muscles or the junction of nerves and muscles and provides a solution as the city’s best neuro rehabilitation centre. These symptoms can affect someone’s ability to walk and perform activities of daily living independently, which can significantly affect their quality of life. Our comprehensive, interdisciplinary team approach (i.e. care being provided by various disciplines in a coordinated fashion) with Physician (physiatrist), Physiotherapist, Occupational Therapist, Speech and Language Therapist, Neuropsychologist, Nutritionist and a Rehabilitation Nurse can help reduce your symptoms related directly to the illness and prevent medical complications that occur as a result of impaired mobility such as blood clots in the veins of the arms and legs, blood clot in the lungs and pressure ulcers. Our treatment is not a substitution for medications that treat the underlying cause but is a supplementation to such treatments to maximize your recovery. Hence you should still see a neurologist for diagnosis and treatment of the underlying problem (when such treatments are available). Not all patients will require all services and usually, a combination of these services is required for an individual patient. You will be evaluated at the initial visit to determine what services you require and a tailored treatment plan will be initiated. Patients will be evaluated by the Physician first to determine the severity of the condition and it’s impact on the patient and then formulate a treatment plan that best suits them. Depending on the patient’s symptoms, the treatment plan will include various exercises and treatment modalities, which will be executed by the rest of the healthcare team. If the pain is excessive, the Physician can also prescribe medications that helps control it. The physician can also recommend appropriate orthosis to mitigate muscle weakness and help walk better or perform daily activities better. 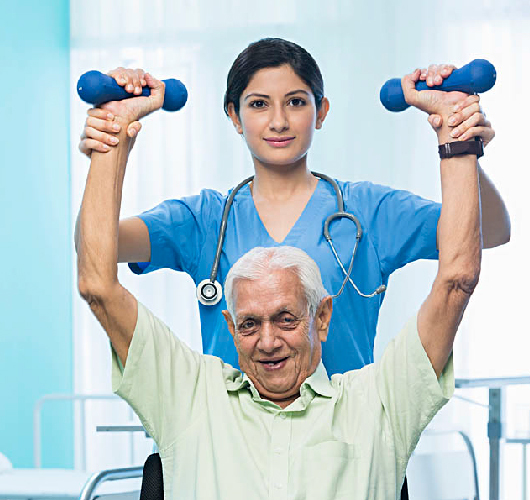 The Physiotherapist trains patients on various physical exercises to improve walking and balance, strength in the arms and legs and endurance. Physical exercises for these patients are unique because on one hand they need to improve strength but on the other hand, they get overexerted very quickly. The physiotherapist also focuses on strategies to prevent such overexertion. They use physical modalities to reduce muscle soreness, burning sensation or pain in the arms and legs and treat and prevent muscle atrophy. The Occupational Therapist will train patients with severe physical impairment to be independent by teaching them various physical activities of daily living such as moving in the bed, transferring from one place to another, eating, dressing, bathing, toileting, and driving.The final phase of treatment involves patient training for successful community integration (education, employment etc). The Speech Language Pathologist (commonly referred to as a Speech and Language Therapist), will evaluate the patient’s swallowing and train them on retraining and compensatory exercises to improve the same. The Neuropsychologist evaluates the patients with depression and anxiety that is commonly seen after any major life-changing illness and guides them through the process of rehabilitation thereby improving their quality of life through motivation and counseling. As adequate nutrition intake is essential for optimal recovery, a Nutritionist recommends an appropriate intake of nutrition. The Rehabilitation Nurse performs and teaches wound care management for patients with pressure wounds caused due to immobility. Treatment duration and prognosis depends on the nature and severity of the injury. These conditions can be broadly classified into two major categories based on their case: Acquired (developed during lifetime excluding genetic and chromosomal causes) and Congenital, genetic and chromosomal (developed during birth, childhood, or early adulthood). In acquired cases, the prognosis is favorable (provided the damage is not severe) compared to the latter and shows a good response to treatment. Complete recovery is possible in some situations and if complete recovery is not possible and you are left with residual symptoms, then our goal is community reintegration (i.e. return to work, return to driving, return to doing activities you did before) despite your physical limitations. In the event that the damage to nerves and muscles are too severe then our goal is to help you achieve an independent lifestyle and keep you as comfortable as possible.